Popular check-in app Foursquare offers great data, showing the places people visit at any given time of day. The data tells a compelling story, especially for events like Hurricane Sandy. 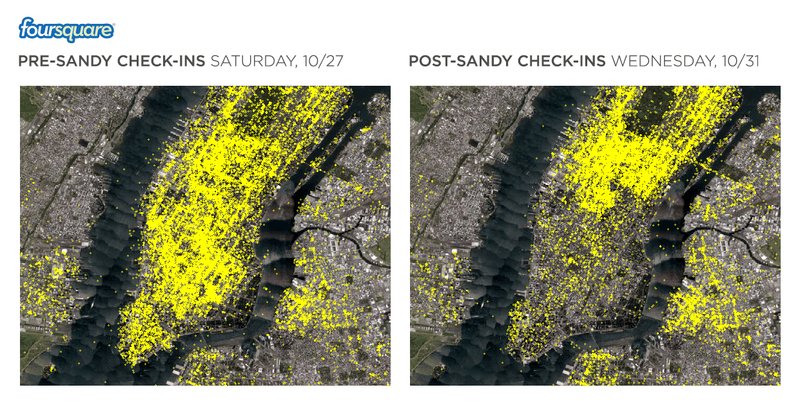 Take a look at a visualization of check-ins in Manhattan on the Saturday prior to the storm and on Wednesday Oct. 31, days after Sandy hit. This really drives home how Sandy created two towns within Manhattan. As you can tell, check-ins were way down all throughout the southern half of Manhattan, where flooding and power outages kept many businesses closed. The decline in check-ins may be partially a result of patchy cell phone service, since you need connectivity to check-in. But much of this was just due to the impacts of the storm on local venues. You can also imagine just how hard this has hit local merchants, who are used to getting a lot more traffic in their businesses.